Like most old-timers, Vancouver’s famed Nine O’Clock Gun has its share of stories, despite its utilitarian purpose and sedentary existence. The gun was made in the Royal Gun Factory in Woolwich, England, in 1816, and was a seasoned war veteran by the time it and fifteen others like it were gifted to the provinces of Canada by the British Government in 1856. First it went to Esquimalt then to its current home in Stanley Park in 1894. When it arrived in Vancouver, it took over as the official time signal from a bell on the Water Street fire hall. Initially it was fired at six o’clock pm to alert salmon fishers to pack it in for the day. It also signalled the New Year, the end of WWI, the start of the Remembrance Day moment of silence, and the death of Captain WD Jones, the Brockton Point lighthouse keeper who for years was in charge of firing the Nine O’Clock Gun. This wasn’t the first time the Nine O’Clock Gun went quiet. A defective firing cap caused it to go silent in 1936 and the nine o’clock ritual was discontinued for the duration of WWII. In 1949 it was quiet again after some delinquents stole the gun’s detonator. In 1960, a lightning bolt set it off, leaving it with electrical issues that made it spontaneously fire at 10:40 pm after the signalman failed to make it fire it at the usual 9:00 pm. Hooligans messed with the Nine O’Clock Gun again in 1974 by tossing rocks into its muzzle. When the gun fired, the rocks showered down on a police boat and a coast guard cutter in the harbour, so again it was temporarily silenced. A decade earlier, a rock hidden in the gun barrel punched a hole in one of the fuel station barges in Coal Harbour when the gun was fired. 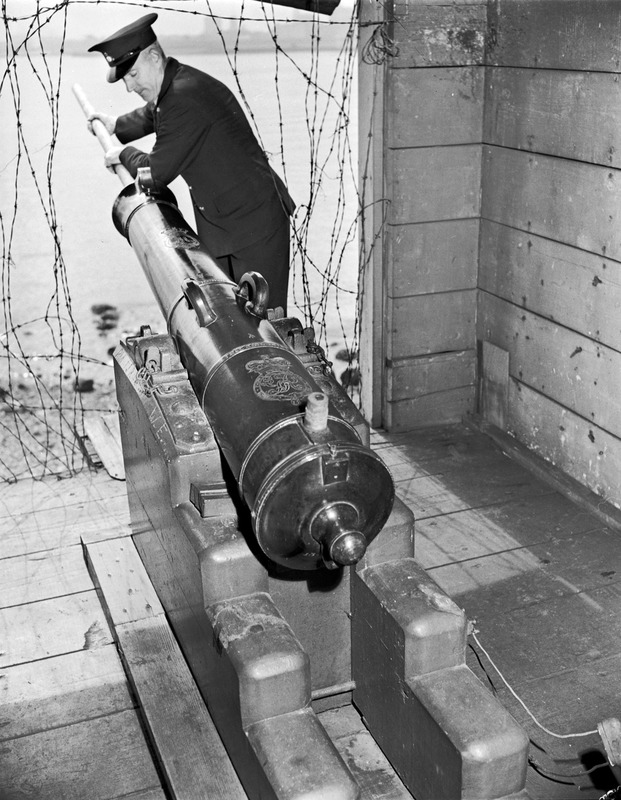 By the 1970s, the Nine O’Clock Gun was set to fire automatically, though not always perfectly. Construction work in the park in 1978 caused it to fire at random intervals for months. At least one shift worker living in the West End was forced to buy an alarm clock to make sure he got to work on time. Dear Sir, As you are probably aware the 9:00 gun has been kidnapped. If the City of Vancouver wants it back a photo of our Mayor Tom Campbell, or a reasonable substitute should appears in the Vancouver Sun on Tuesday donating a hundred dollars to the Children’s Hospital. The ransom demand was dismissed by Deputy Mayor Hugh Bird, but some civic-minded citizens raised close to four hundred dollars for the Children’s Hospital. The president of the UBC undergraduate society confirmed that the gun would be returned. In the meantime, two UBC physics students crafted a homemade gun to serve as a stand-in for the real thing. The most recent indignity suffered by the gun was a less successful prank by UBC engineering students in 2008, who painted it red. Perhaps they planned to “kidnap” it again, but discovered it had been welded into place after the 1969 incident.